The CSM-eSTEP was designed as a cost effective E-cigarette puffing machine. 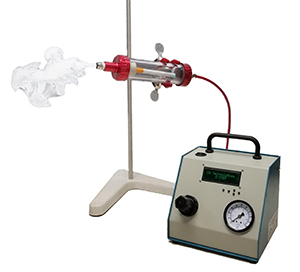 Because of it's small size and SIGNIFICANTLY lower cost (when compared to traditional smoking/vaping machines), the eSTEP is ideally suited for small scale analytical or inhalation exposure applications as well as pilot studies. Unlike conventional smoking machines, it is not a suction device. The system consists of a micro-controller, a positive pressure driven control box and a modular holding chamber which can be crafted to accommodate disposable, or cigalike types as well as tank types (either button or flow activated). E-power is not controlled nor supplied. The modular E-cigarette holding chamber is custom designed for the end user's brand and model of E-cigarette. It is engineered to fulfill a wide range of application requirements. The eSTEP can be adapted to work with any combination of cartomizer (tank) and battery regardless of style or size (note: extra cost options apply). The eSTEP utilizes positive pressure puffing (note CORESTA CRM 81 defines puffing by suction) a puffing method that is very attractive for analytical applications that require non-aged E-cigarette vapor to be generated or sampled right from the mouthpiece of the vaping device. The user can select a pre-programmed CORESTA style vaping protocol or create a custom protocol. This custom vaping device allows the user to adjust the puff length, puff volume and puff period all from an intuitive, push button display.